From Tolkien’s Middle Earth to the operahouse of Richard Wagner. A journey in which the adventures of Hobbits, Elfs and Orcs are measured against the where-abouts of Wotan, Walsungen and Nibelungen. Both Tolkien’s Lord of the Ringss and Wagner’s Der Ring des Nibelungen are centred around a ring of absolute power. Halfway the 19th century, when Wagner wrote the libretto for his Ring-cycle, the industrial revolution was steaming ahead full throttle. Except aw and believe in human progress those rapid technical developments raised suspicion. If mankind was able to develop machines to produce on large scale it would also be able to design weapons to kill on large scale (the First World War would indeed materialise these nightmares of Armageddon). The dark side of human inventiveness lay at the base for Der Ring, a weapon so strong the owner could dominate the world with it. 70 years after Wagner Tolkien created his version of an almighty ring: The Lord of the Rings. Similarities between both stories are remarkable. Basically because they used the same sources for inspiration. 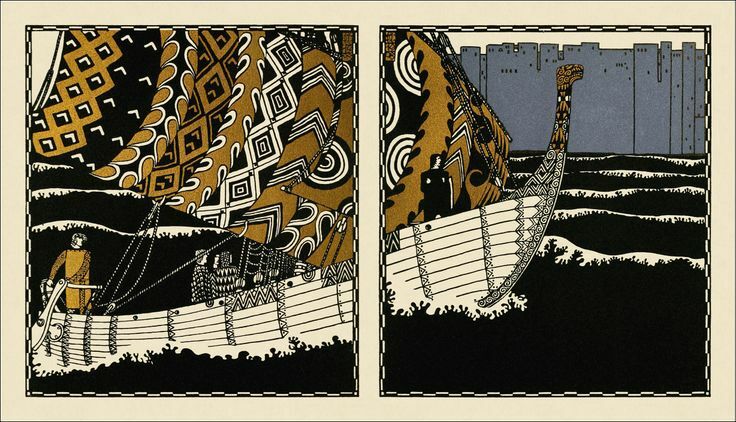 Old myths and sages from which Das Nibelungenlied is the most prominent one. The similarity that draws the most attention; the ring, however is a typical modern addendum. It is there where Tolkien's statement that he didn't borrow the idea from Wagner might raise some suspicion. 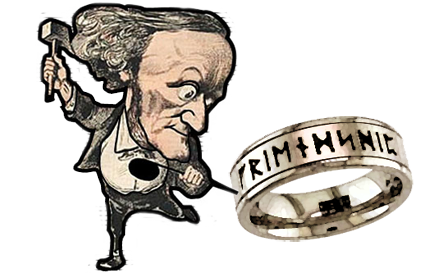 Already in the 19th century the sources that Wagner used for his Ring-cycle were out-of-time. More often in opera key ingredients for librettos were sought and found in subjects that had their roots in actuality. Gods and dragons were outdated. When Tolkien came up with his ring, fantasy as a genre did not exist. 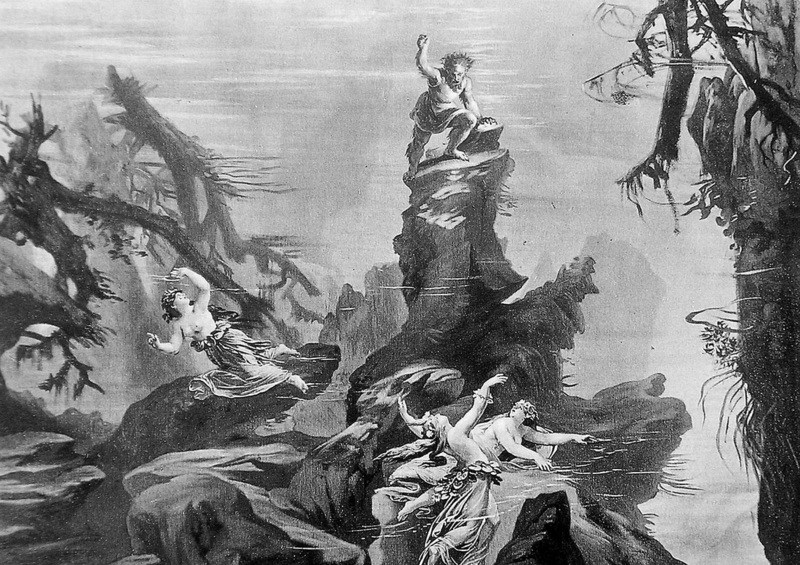 Wagner's Ring-cycle did change the world of opera, of theater, of music. Tolkien's story gave birth to a genre that flourish nowadays like it never did before. You can call his incarnation of the story of an almighty ring an Anglo-Saxon update of Wagner's German operas. The necessity for that update might be found in Wagner's ideas about human nature (those were Schopenhauer-kind of depressive) and the Nazis who used Wagner as their PR-guy and stained the old myths and sages with an all too realistic calling for arms. Indeed the characterisation of good and evil is very clear in Tolkien. Wagner is much more ambiguous. The only character in his Ring-cycle that qualifies for the role of hero is Siegmund but that man doesn't survive the second opera (Die Walkure) of the cycle (imagine Aragorn dying halfway the LOTR-trilogy). Long before George R. Martin's Game of Thrones made it cool (again) to kill main characters Wagner showed little compassion for the fate of a beloved character either. Much to his own grief. While working on Die Walkure he wrote in a letter to Carolyn von Wittgenstein (partner of Franz Liszt) that composing the best music he could for the sad fate he had in store for the Walsungen twin Siegmund and Sieglinde left him emotionally drained. The result, however, is a devastating piece of music drama. Die Walkure is genre transgressing opera. You don't have to love opera to love Die Walkure. Like you don't have to like pop music to love The Beatles' Revolver and you don't have to be a jazz cat to like Miles Davis' Kind of Blue. Tolkien knew the horrors of war first hand. Perhaps it is therefore that he wanted to create something that his public eventually could feel good about. With Wagner this is of secondary interest. His goal is not merely entertaining. His goals are also educative and purifying. Art has to be able to answer life's questions and his music dramas are designed for nothing less than that purpose. In Der Ring Alberich steals the Rhinegold to forge the ring. A ring that can give him world-power but that power comes with a price. He has to denounce earthly love. Ugly as he is, his last illusions about love crushed by the Rhinemaidens, he does so. The power he is about to gain is so immense that even Wotan, the chief god, starts to become frightened and steals the ring from Alberich. Not any time sooner than now had Frodo realised that the moment he had to throw the ring in Mount Doom would really come. He was attached to it, to say the least. Addicted like a junk to his drugs. Concerned like a parent that feels responsible for its child. To throw the little round thing into the lava of Mount Doom would feel like betrayal. Betrayal towards the precious object he had sworn to protect with his life. Hobbits and dwarfs. They are so like us: humans. The moments of decision, the fear of loss, the urge to do good. It is not bound to everyday reality. The elements of fantasy are a shell, the themes beneath it are purely human. They touches us where we keep our dreams, a place we better hide for sunlight. A treasure chest we can open at those moments when the normality of every day life becomes too ever-present. Young Siegfried is a fool. A child who lost his mother at birth, raised by Mime, brother of Alberich. Siegfried knows no fear, and can't be brave for that matter. 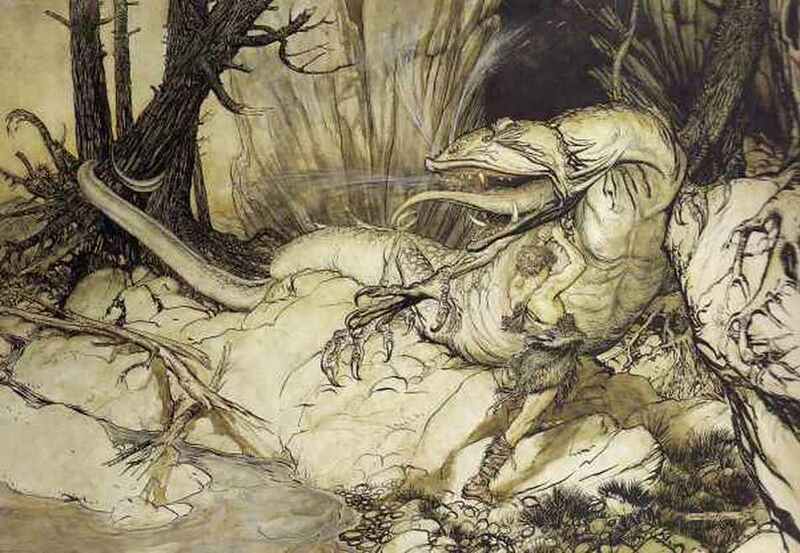 He kills Fafner the dragon and comes in the possession of the ring. 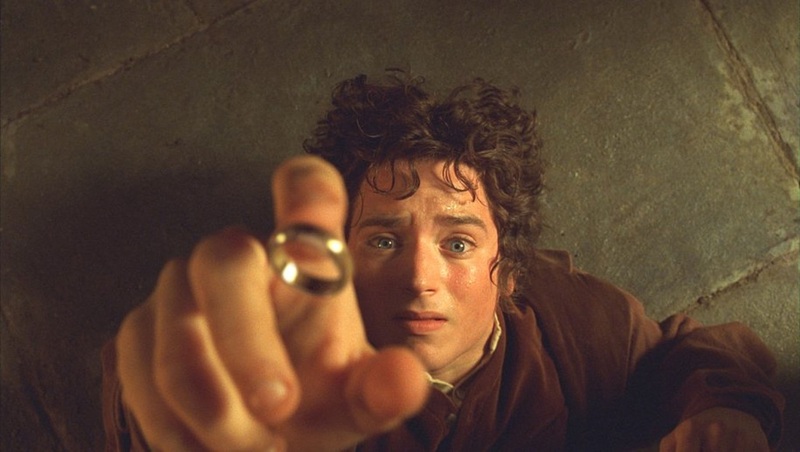 What he has in common with Frodo is the fact that thanks to (or despite) its devastating power he finds it very hard to let go of the ring. His life will end in ill-fate. Betrayed by the woman who was his lover. Tolkien grants Frodo a long life with the Elfs. Wagner is after catharsis, Tolkien is from the entertainment department. At the turn of this century - every year with Christmas - there was a new episode of the Lord of the Rings-trilogy in the cinema. I came to make acknowledgement with Middle Earth. A place that, like the desert in David Lean's Lawrence of Arabia, was a character (if fact it was many characters) of its own. The Shire where Hobbits drank their beer, did their gardening and kept their cattle, was cast over by the shadow of evil forces that darkened the little idyll. And there the journey across Middle Earth began. It drew me in. The Making-Off footage of the DVDs were almost as intriguing as the movies themselves. Hobbits, Elfs, Orcs, dragons en giants. It is very easy to go with the premiss that they all deserve our love, appreciation, fear and loathing. Why can we be touched by the lifes of fictional characters? Sometimes even more easily than by the troubles our close relatives has to face? One of the big advantages of art is the capability to let the audience experience its feelings and emotions in a safe way. There is no opera aria, or movie scene, where the public can't recover from (although the end of David Fincher's Seven does a fierce attempt). No limp ever has been lost on the showdown of a movie that ends with the dead of its protagonist. It is a precious thing. She gives us, humans, perhaps the illusion that we can learn from the experiences from others. And it suggests, if we take it one step further, that we don't have to make the same mistakes generations for us made (I burn a candle for that one). The non-existing of Frodo and Gandalf in the real world is no obstacle to believe in their adventures. And so it also works with opera. The first objection – why do these people sing and not talk? – is not a point of consideration anymore once you have attended a good performance of an opera from Der Ring des Nibelungen. As with the element of fantasy in a movie, the singing in, let's say, Götterdämmerung won't prevent you from going with the story and the emotions it communicates. As an art-form opera is no more abstract than film. There will be no violins and drums to spice up the romantic and exiting moments in real life either. It won't prevent your feelings and emotions being steered in a certain direction when you hear music in a movie. When we choose the music for our weddings, funerals and parties we make the soundtrack of our own life. Our own film. Our own opera.